Thank you for your interest in presenting at Homebrew Con. The application period closed Monday, December 17, 2018. 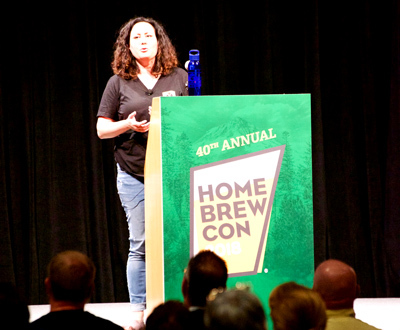 Conference presentations are focused on homebrewing, or topics related to homebrewing. Serving beer during a presentation is welcome, but is not necessary, and should only be done as it relates to your topic. Presentations are typically about 45 – 50 minutes long and should allow 10 – 15 minutes for questions at the end. The allotted seminar time is 60 minutes. Seminar presenters are given one complimentary full conference registration. Travel, hotel and other associated expenses are not covered by the American Homebrewers Association. Supplier-generated presentations that only explore one specific product or solution will not be considered. Suppliers wishing to present specific information on their products should consider a sponsored demonstration. Proposals from suppliers are welcome when balanced approaches are presented and they do not mention specific products by name. Submit proposals by Monday, December 17, 2018. Alternative Fermentation – seminars focused on any non-beer fermentation including (but not limited to) mead, cider, sake, perry, cheese, bread, kimchi, etc. Beer Styles – these seminars focus specifically on one style of beer (i.e. IPA, session beers, lagers, etc.). Brewing Process – these seminars focus on the wide variety of ways to craft homebrew, and the process involved (i.e. BIAB, decoction mashing, barrel aging, etc.). Clubs & Competitions – this track covers anything focused on operating a homebrew club, or running a homebrew competition. Do-It-Yourself – for the DIY homebrewer looking to get into the nitty-gritty of their brewing gear and serving equipment. Going Pro – these presentations will focus on the future professional brewers. Historical – the rich history of beer and brewing is discussed in these seminars. Homebrew Industry – these seminars will focus exclusively on the homebrew retail industry. Ingredients – these seminars cover the use of water, malt, hops, spices, etc (yeast is a separate category). Other/Misc. – any seminar that does not fit into one of the other categories can be submitted here. Recipe Formulation & Improvement – seminars designed to help the audience improve their homebrew or design the best beer possible. Sensory Analysis & Food Pairing – these seminars will focus on attendees that wish to improve their palate. Yeast & Fermentation – subjects pertaining to the fermentation process. Posters are an ideal way to present a topic when an oral presentation does not fit the standard seminar format. Posters pertaining to any aspect of homebrewing are encouraged. Posters are limited to 3’x4’ in size. Poster and design materials are not provided by the AHA; those interested in presenting will need to provide a poster. Posters are displayed in the Social Club throughout the conference. The AHA will provide an easel and area to display your poster. Presenters are encouraged to accompany their posters for a set period of time as assigned by the AHA, typically during a 90-minute span. You are encouraged to leave your poster up for attendees to view even when you are not presenting. Posters that focus on selling a specific product or service will be asked to be removed. Conference registration, travel, hotel and other associated expenses are not covered by the American Homebrewers Association.